Leisure Island is a dangerous place. It evokes complacency within an environment set in isolation from our physical landscape. I like so many other people enjoy a good island, but an urging sense of disturbing proportions hovers around me as I sip my extra dry grande double shot cap cappuccino on the rocks. 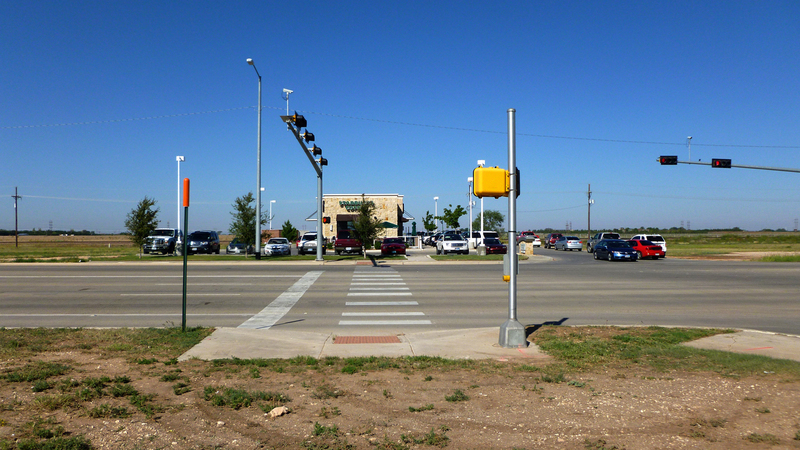 Most North American commercial architecture, such as Starbucks, construct a surrounding landscape dependent upon vehicles while leaving any form of human-scale spatial engagement to the pushbar at their entry door. The end of the surrounding pavement denotes a hard boundary between leisure island and “dead” terrain. Small clumps of coffee trash accumulate in the shadow lines of the concrete pavement edge, evident that these adjacent landscapes in development limbo receive little attention and exist on the fringes of human conscious. In fact it is beneficial to pay attention to these forgotten landscapes of parking pavement and between lots as they too are valuable ecosystems, mysterious terrains, and potential destinations full of complex negotiations. Within the last couple of years people across disciplines, such as architect Jason Griffiths in “Manifest Destiny” and the environmental journalist Emma Marris in “Rambunctious Garden”, are drawing attention to these overlooked spaces and pointing out the unconventional value often dismissed. Earlier in 2008, the Walker Art Center held the exhibition “Worlds Away: New Suburban Landscapes” showing a collection of work by artists, architects and writers reflecting on our quintessential built American environment. More common to the architecture world is Alan Berger’s book “Drosscape” in which he documents and describes the “waste” space left over from expansive building / infrastructure, advocates for the value of Drosscape as an integral component of human civilization, and urges architects, city planners, and developers to realize the design potential. Ignasi de Sola-Morales visualizes the between urban spaces as Terrain Vague, vacancies within the urban landscape full of imagination by remaining in descriptive limbo. I consider these places Nameless Landscapes, and define the terrain as a conflation of suggested develop and natural states. Nameless Landscapes display traces of human, machine and natural intervention. They are an urban collage constructed of autonomously layered situations, sparsely populating a field of vaguely identifiable built elements. They resist any single definable term and are often discarded because of ambiguity. However, in the ambiguity lies the ability of multiple interpretation and simultaneous use. Architects, as built environment connoisseurs, have a responsibility to recognize and acknowledge the mass accumulation of Leisure Islands within North America and respond to the indifference most people associate with subsequent “dead” adjacent terrains. Unlike convenience and leisure, our landscapes are hardly predictable and enticingly complex. Relationships any Architecture should make evident. This entry was posted in lubbock, space and tagged Leisure Island, Nameless Landscape, North America, Starbucks by vmcreynolds. Bookmark the permalink.